One of Ireland’s most luxurious Castle Hotels in Roscommon Ireland, the ancestral home of the Tennison family and the legendary Colonel King Tennison. It is one of a few Irish castle estates that can trace its history back to royal families. 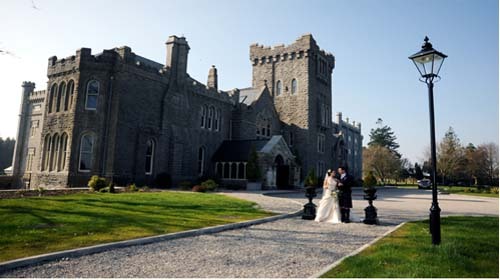 This secluded, luxury, Roscommon Castle hotel is majestically set on the shores of Lough Meelagh, surrounded by over forty acres of breathtaking Irish scenery, lush green pastures, ancient forests and historical points of interest. Approached by a meandering drive that passes acres of magnificent Roscommon lawns, the luxury Castle hotel will overlook the site for a proposed Nick Faldo Designed 9 Hole Par Three Golf Course and a glistening lake which commands the panoramic beauty of the surrounds. Our World Class Spa & Leisure Centre is now open. Relax and unwind in our Pool or let us pamper you with one of our luxurious treatments. 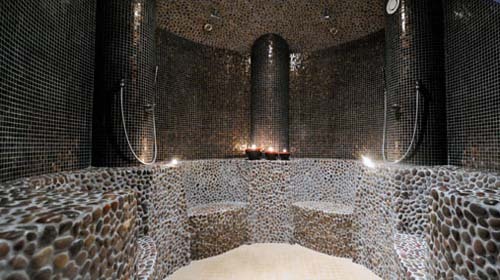 Our commitment is to provide the highest level of luxury, comfort and service. You will enjoy old world elegance with modern day comforts. One step inside Kilronan Castle, Roscommon and you are at home. With our warm and friendly atmosphere we will see to your every need, everything has been designed with your desires in mind. Kilronan comes from the Gaelic ‘Cill Ronain’, which means Ronan’s Abbey, the ruins of which are close by, as well as St Ronan’s Holy well and the hollow stone he used for the baptism of his followers. The original Castle was built in the early 1800’s and belonged to Colonel King Tenison. It was extended by the 12th Earl of Kingston in 1876 with a five storey over basement baronial tower and battlements. During the Edwardian period, the Earl and Countess of Kingston enjoyed the estate until political and social change saw the closure and sale of Kilronan and other country estates both in Ireland and abroad. The Tenison family originated in Oxfordshire in the era of Edward 1st but fought with the Irish Brigade in France and on behalf of The Pretender, Bonnie Prince Charlie. Their colourful history continued through involvement in the Peninsula Wars in Spain and Portugal. They were represented at The Battle of Waterloo where Napoleon was finally defeated and served as members of The Irish Guards in the Boer War. One was a close friend of the poet John Milton. Most generations tended to squander their inheritances but then they or their sons would marry an heiress and their fortunes would bloom again. Roscommon was famous for music in ancient times and Ireland’s greatest harpist, Turlough O’Carolan, is buried nearby. He was welcomed into the castles of Irish Chieftains like the O’Rourkes of Breifne and his music will live on in special events planned for Kilronan. Soon, Kilronan Castle will be offering the hospitality and traditional welcome that has made its sister estate, Lough Rynn so popular. 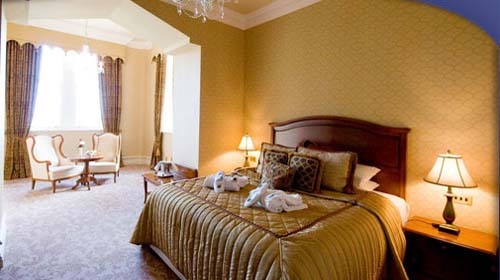 Kilronan Castle, Ballyfarnon, Co Roscommon, Ireland is comprised of 84 unique Bedrooms and Suites. Our luxury Castle hotel bedrooms offer a wonderful mix of old world elegance and up to the minute standards and facilities including air conditioning. 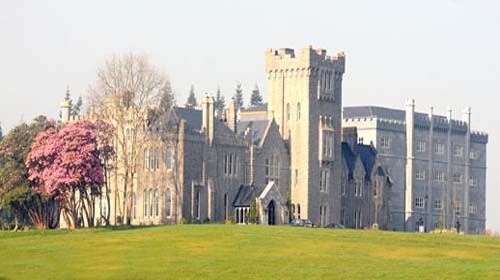 With a reputation built on its unparalleled warm hospitality, guests will understand just what a special experience it is to stay at Kilronan Castle. The smallest things are the most important to us, and we know that our careful attention to detail is what inspires our guests to return. Relax and unwind in your room: call room service and order a glass of champagne before dinner – or alternatively, we can arrange for dinner to be delivered to you. Our staff are also happy to arrange fresh flowers, handmade chocolates or champagne at your request, should the occasion call for it. Just ask! Each of our luxury spacious suites have been individually designed and meticulously furnished in accordance with the changing shades and moods of the Castle’s landscape. Equipped with every contemporary comfort, these rooms fuse modern luxury with a touch of old-style glamour. The Douglas Hyde Restaurant, named after the first President of Ireland, who was born in Castlerea, County Roscommon, offers an elegant, fine-dining experience which is unique in the region. With research and tasting of local fresh produce, our Head Chef Rory Gabriel, who has received many accolades for his culinary expertise, has created a series of Table d’Hote and A la Carte menus which use suppliers from Roscommon and the surrounding counties. The discreet service and luxurious furnishings of the Douglas Hyde Restaurant offer a perfect setting in which to enjoy the traditional art of elegant dining. Our wines have been carefully selected from vineyards across France, Italy, Spain and the New World. The Douglas Hyde Restaurant is open daily for dinner from 6p.m. until 10p.m. & for Sunday lunch from 1.00pm until 3.30pm Please contact us for details of our lunch and dinner menus suitable to intimate group bookings for special occasions or corporate celebrations. The lawns provide a breathtaking setting for a Champagne or Drinks reception on a Summer’s day - and the Castle’s backdrop is equally spectacular for a Winter Wedding. Perfect for a grand affair, The Grand Ballroom in Kilronan castle can cater for 320 people while providing exquisite décor that sets a tone of opulence underneath magnificent chandeliers. The SPA at Kilronan Castle is dedicated to offering you the ultimate in luxury pampering treatments and packages, created to transcend you into a world of escapism. Choose from the newly introduced treatments and product houses including SPC and Kimia Skincare, Lycon Waxing, and Bare Escentuals Make Up and perfume Studio. Our highly qualified team have years of experience and expertise in the industry, we are confident that we are offering you the best! The spa is designed with both male and female clientele in mind; our interiors have been specially created for your total comfort and well being. Feel free to explore our luxurious collection of half-day and day retreats, as well as personalized individual treatments and discover for yourself why Kilronan Castle Estate & Spa is the place to be. We specialize in group bookings, whether it is a girls’ getaway or corporate meeting, we can design retreats and packages to suit your specific needs. Situated just 45 minutes from Sligo Airport, one hour from Knock International Airport & 2 hours from Dublin International Airport, Kilronan Castle is the ideal base from which to explore the vibrant cities of Sligo, Dublin and Galway, the magical lake region and Ireland’s rugged West Coast. A ruined Gothic revival castle on the shores of Lough Meelagh in County Roscommon. A romantic, historic building in a breath-taking location is bought by the people who restored the magnificent Lough Rynn Estate. This is going to be something very special indeed.